Gift is given to express respect or feelings towards a person. Sometimes, gift is given to a person to cooperate. Always, take care while giving gift. Because giving wrong gifts can make matters worse. Right gift strengthens the relations and we can also get benefits. 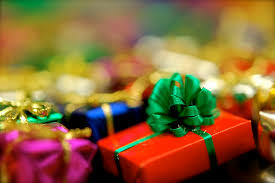 The packing of gifts, especially packing paper color, is also important. It is auspicious to gift everyday use products. Avoid giving decorative items. Gift shrungar and beauty products to only closed relations. Do not gift one’s gift to another. Do not gift glass and Taj mahal in love relationship. Do not give god-goddess image in gift. Gift pen or book to elder or guru. Gift fragrance, beautiful clothes or flowers in love relationship. Gift clothes, house stuff and sweets in marriage ceremony. Gift silver items in child birth. It is extremely beneficial to gift watch to spouse. Gift chocolates or music stuff in friendship. Gift fragrance candle or watch in broken relationships. Aries - Gift beauty products and fragrance. Taurus - Gift sweet products. Gemini - Gift decorative statue. Cancer - Gift electronics items. Leo - Gift shoes, belt and wallet. Virgo - Gift pen, books or lamp. Libra - Gift chocolate, sweets or syrup. Scorpio - Jewelery or fragrance stuff. Sagittarius - Gift electronics or utensils. Capricorn - Silver stuff or light lamp. Aquarius - Wooden stuff or jewelery. Pisces - Gift plants or books. Good Luck: Use ginger in afternoon meal to get rid of addiction.